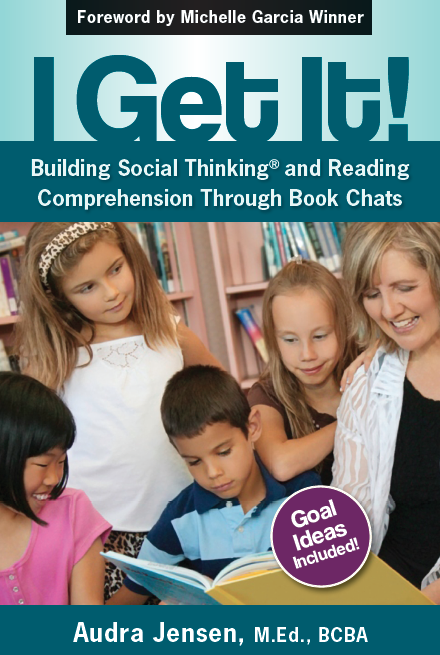 For parents and professionals to use with students 3rd grade and up. 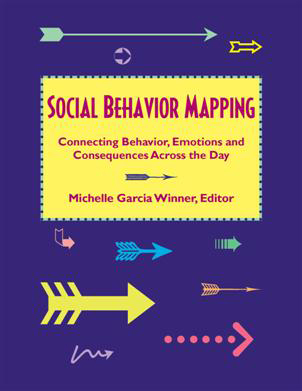 Social Behavior Mapping is a strategy described in detail in one of our core books on Social Thinking, Thinking About You Thinking About Me, and also in the book Social Behavior Mapping: Connecting Behavior, Emotions and Consequences Across the Day. 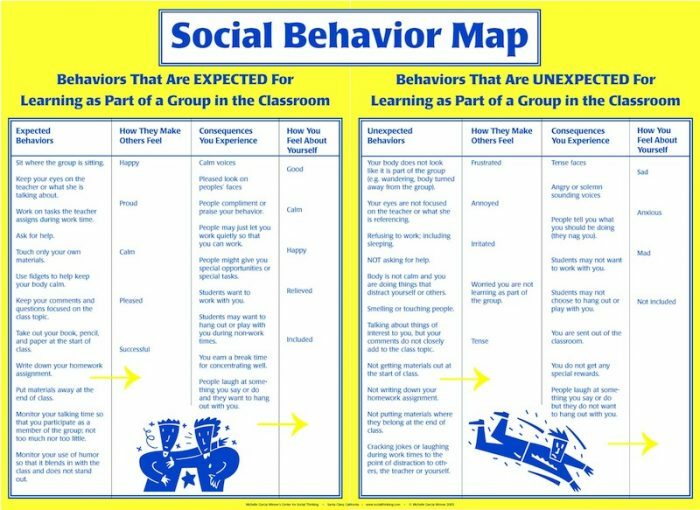 The purpose of a Social Behavior Map is to help students learn how each of their behaviors has an emotional impact on the people around them, which can result in positive or negative consequences for the student. This poster outlines a map for one specific, but important, social situation: listening to the teacher talk during class. One student is squirming in her seat and shuffling her feet back and forth on the floor. Another is tapping his pen. A third is staring out the window. Some students are frustrated because they want to listen to the teacher but they’re constantly being distracted. While a Social Behavior Map can be personalized for each context and person, this poster demonstrates how the concept can be used with a group to specifically address the situation: listening to the teacher talk. 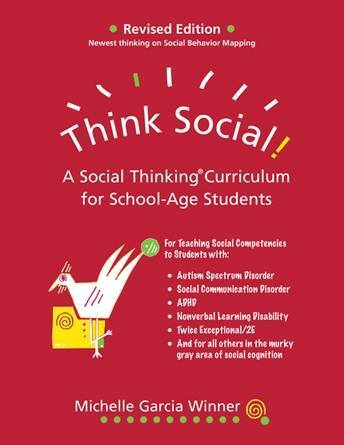 It outlines some of the expected and unexpected behaviors when in this group social situation and the different thoughts and reactions others (especially the teacher) may have to these behaviors. 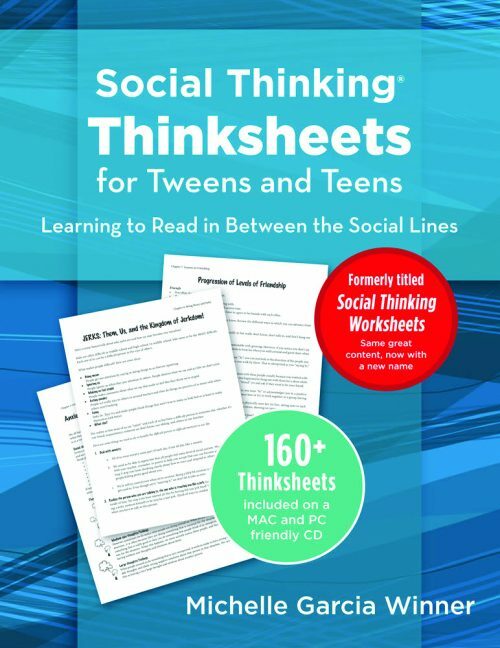 Social Behavior Mapping is a strategy described in detail in one of our core books on Social Thinking, Thinking About You Thinking About Me. The purpose of a Social Behavior Map is to help students learn how each behavior they do has an emotional impact on those around them, and that how a person feels contributes strongly to how s/he reacts to another person’s behavior. 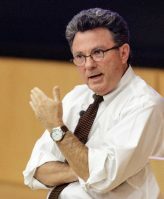 As individuals learn about the thoughts–feelings–behavior connection, the final lesson is ultimately that how we feel about ourselves is related to how other people treat us. 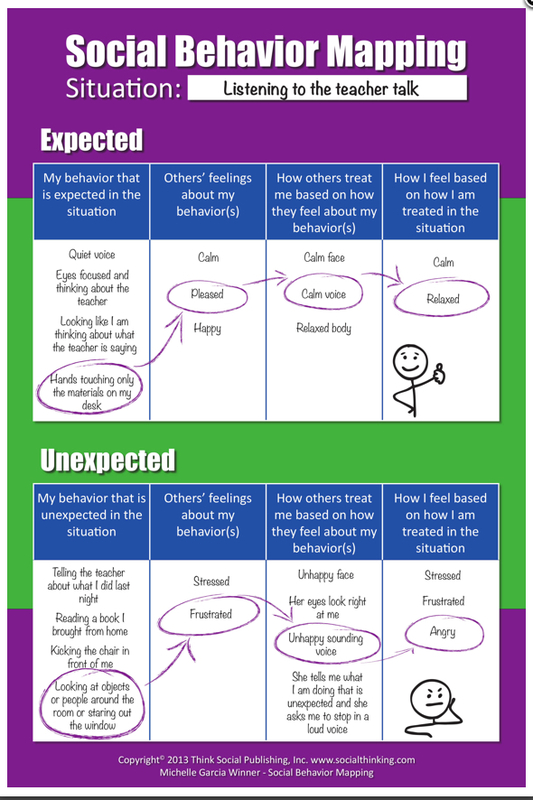 A Social Behavior Map gives teachers a visual tool to discuss with students the link between their expected behaviors and the positive emotions of others, which contribute to positive consequences for the student, ultimately helping the student feel better about him or herself. 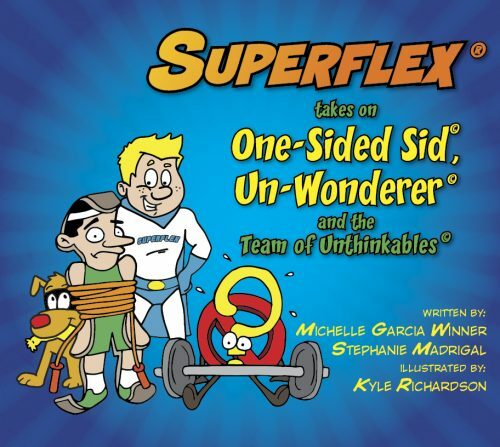 It also helps students link their unexpected behaviors to negative emotional reactions and related consequences from others, impacting negatively how the student feels about him or herself.